Before Going to Study MBBS in Kyrgyzstan, You should know about the beautiful country Kyrgyzstan which is located in the central part of Asia and follows a parliamentary republic system. Kyrgyz is the national language of the country which bears a close resemblance with that of different Turkic languages. It also shares strong cultural and historical ties with the country. The country is divided into seven provinces, which consists of different districts and is administered by governors. It is bounded by Kazakhstan on the northwest and north, by China on the east and south, and by Tajikistan and Uzbekistan on the south and west. Most of Kyrgyzstan’s borders run along mountain crests. Bishkek is the capital of the country. Kyrgyzstan was earlier part of Soviet Union and got separated later on, the reason of these low cost of the fees is because low rate of inflation and low rate of economy which makes education also at lower cost. MBBS in Kyrgyzstan is very popular destination with Indian medical students who fail to get MBBS admission in India as the tuition fee is very reasonable there and quality of education imparted is excellent. MBBS in Kyrgyzstan is the best option for MBBS abroad at low cost. MBBS in Kyrgyzstan is the answer for “Cheap and Best MBBS in abroad” question of many students. If your budget is less than 11 lakhs and you want to take admission in MBBS in that budget then you can take admission in MBBS in Kyrgyzstan. We have some very famous and prominent Universities which provide admission and serve high quality education in low budget. The valleys have hot dry summers, with a mean July temperature of 82 °F (28 °C). In January the average temperature is −0.5 °F (−18 °C). 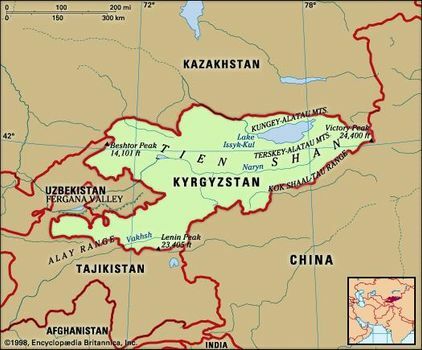 Annual precipitation varies from 7 inches (180 mm) in the eastern Tien Shan to 30 to 40 inches (760 to 1,000 mm) in the Kyrgyz and Fergana ranges. In the most populous valleys, rainfall ranges from 4 to 20 inches (100 to 500 mm) a year. Osh – Kyrgyzstan’s second biggest city, Osh is situated to the south of the country in the Fergana Valley. Jalal-Abad – Jalal-Abad is Jalal-Abad Region’s economic and administrative center. Located in the Fergana Valley’s north-eastern end. Karakol – Karakol is the fourth biggest city in Kyrgyzstan and is located near the Lake Issyk-Kul’s eastern tip. Tokmok – Tokmok is Kyrgyzstan’s fifth biggest city and lies at an altitude of 816 meters above sea level. As a student, you should make sure that the university you choose for Study MBBS in Kyrgyzstan is included in this list. MCI might not approve your education if you study in a university which is not present in this list. You can contact us to know more details about studying medicine in Kyrgyzstan We will assist you in every way possible. Admission Process for MBBS in Kyrgyzstan is very easy, to get admission in Kyrgyz medical universities, you do not need to pass any test, or having a big amount of money to get student visa. Students who get back or can not pass in any examination get to reappear in it within one month, which saves their year. If you wish to study medicine in Kyrgyz Republic, the Faculty of Medicine of Jalalabad State University will be the best choice. Because of its competitive education and liberal cost of study JaSU Faculty of Medicine is becoming increasingly well known among international students. It offers a full proficient education programme, so that upon the finishing of studies, graduates can effectively proceed with their education in the selected speciality’s program or medicine field’s Masters program in Kyrgyz Republic or in another nation of the world. Students have the chance to consider under the direction of knowledgeable professors from universities from Kyrgyz Republic and abroad, as well as to acquire up-to-date knowledge and skills, which are competitive in Eurasia and the world. Kyrgyz State Medical Academy is a leader in medical education in the Kyrgyz Republic and the most dynamically developing institution of higher education in Central Asia. In KSMA work 526 teachers, of which 86 professors and doctors of medical sciences, 315 candidates of medical sciences and docents. We are learning more than 4,000 students – citizens ofKyrgyzstan, CIS countries and 17 foreign countries. Lots of Indian student go, especially from Orissa, Bihar and MP. The International School of Medicine established in 2003 was made a part of the International University of Kyrgyzstan according to the Kyrgyz Republic’s Government resolution # 60 dated 05.02.2004 as a currently operating higher school. At present the school has about 2000 students from Central and South Asia. is to train highly qualified specialists, conduct scientific research in medicine of mountains, and provide health services to the population of Kyrgyz Republic and neighboring countries. Training at ISM is conducted with the most up-to-date educational technologies used to ensure highly efficient training of doctors. The ISM’s primary goal is to produce highly qualified doctors able to successfully work in any part of the globe. The International School of Medicine of International University of Kyrgyzstan is an official state educational institution with the license of Ministry of Education and Science of Kyrgyz Republic for medical education in General Medicine within 5 years of study. (Official license No.LD 140000115).